The Chartered Institution of Water and Environmental Management (CIWEM) has welcomed the reports by the House of Commons Environmental Audit Committee on Air Quality and the IHPC review for Defra and the devolved administrations of Local Air Quality Management. Both reports highlight problems in recent years in tackling vehicle traffic-related Particulates (PM10) and Nitrogen Dioxide (NO2) with London and other parts of the UK likely to see failures to meet EU targets on both pollutants. The Environmental Audit Committee highlighted that up to 50,000 people may die prematurely in the UK each year because of poor air quality and clear political will and resources are required to improve this picture. CIWEM believes that the Government has taken the wrong approach to tackling the problem, as well as failing to recognise the relevance of poor air quality in Britain today. National computer modelling has consistently predicted improvements in air pollution that have not materialised in practice. More people die from unsafe water than from all forms of violence, including war. CIWEM believes that these deaths are an affront to our common humanity and undermine the efforts of many countries to achieve their development potential. This year, CIWEM’s annual publication, The Global Environment, highlights the success of Polio reduction through universal vaccinations and improved sanitation. Polio is a highly infectious disease caused by a virus that enters the environment through contaminated faeces. It invades the nervous system and can cause paralysis in a matter of hours. Globally, cases have decreased by more than 99 percent since 1988. However, wastewater management is a major challenge, with 80 percent of all waste in developing countries discharged untreated because of lack of regulations and resources. Increasing population growth, rapid urbanisation, discharge of industrial chemicals, climate variability and invasive species are key factors in contributing to the deterioration of water quality. And, despite progressive improvement in the provision of sanitation since 1990, an estimated 1.1 billion people rely on unsafe drinking-water sources; 2.6 billion people lack access to improved sanitation; and 2.2 million people die every year from diarrhoea, most of them children under the age of five. The Institution fully supports the theme of this year’s World Water Day, Clean Water for a Healthy World, as it emphasises that both the quality and the quantity of water resources are at risk. The lack of prioritisation of water quality in many countries has resulted in decreased allocation of resources, weak institutions and lack of coordination in addressing water quality challenges. As a matter of urgency, CIWEM demands that the importance of water quality is recognised at the highest political level, so that quality considerations are made alongside those of quantity. The Institution also continues to call for a full review of the Millennium Development Goals and requests that targets are amended to reflect the increasing impact of climatic change. Egham, Surrey, UK, March 2010: Verbatim, a Mitsubishi Chemical company, will announce its entry into the European LED and OLED lighting markets at Light + Building 2010. Verbatim is a global consumer brand best known for Optical Media, External Hard Drives and Flash Memory data storage. Mitsubishi Chemical Corporation is one of the largest chemical companies in Japan and a world leader in materials for LEDs. Visitors to the Verbatim stand at Light + Building 2010 will have the first chance to see Verbatim's forthcoming LED lighting products and witness the user benefits of the company's unique approach to the design of high colour rendering index LED and colour tunable lighting systems. Verbatim's first LED lighting products will be on sale later this year. The stand will also feature the world's first dimmable/tone adjustable OLED prototype which has been developed through the recently announced Mitsubishi Chemical Corporation and Pioneer Corporation OLED alliance (http://www.m-kagaku.co.jp/english/newsreleases/2010/20100209-1.html). Gary Milner, President, Verbatim EUMEA: "At the Light + Building show we will reveal LED lighting technology that not only provides superior performance over compact fluorescent lights (CFLs) but also offers visible advantages over other LED lighting products on the market today. Our objective is to provide consumers with a better experience of low energy lighting at a competitive price. As with our data storage products, we will be offering technology consumers can trust, based on the many decades of materials and manufacturing expertise of our parent company, Mitsubishi Chemical." For a given light output, LED lights consume significantly less power than conventional incandescent bulbs. This means that LED lights create the lowest CO2 emissions when powered by conventional sources. They have a typical life of over 50,000 hours, which is equivalent to 15 years (this Calculation based on 10 hours x 365days). Mitsubishi Chemical's raw materials for making Verbatim LEDs, including GaN (Gallium nitride) substrate, encapsulant and phosphors, ensure superior efficiency over other LED technologies. Verbatim's businesses in Europe/Middle East/Africa, the Americas, and Asia Pacific are wholly owned subsidiaries of Tokyo-based Mitsubishi Kagaku Media Co., Ltd. MKM's parent company, Mitsubishi Chemical Corporation is one of the largest chemical companies in Japan. From its foundation in 1969, Verbatim has shaped the development of data storage technology from floppy disk and magneto-optical storage media, to CD, DVD and high definition Blu-ray. In addition to its global leadership in Optical Media, Verbatim offers a wide range of Flash Memory Cards and USB Drives, SSD Memory Cards, External Hard Drives and computer accessories. Verbatim is now entering the LED lighting and organic LED (OLED) markets with innovative technologies and products designed to provide a better lighting experience for consumers, coupled with low power consumption and long life. The Conservative Party’s Energy Policy paper “Rebuilding Security” was welcomed today by RenewableUK, the country’s leading renewable energy trade association, as a constructive set of proposals which forms a good basis for a detailed roadmap. The document, launched today by Conservative leader David Cameron and the Shadow Energy and Climate Change Secretary Greg Clark, sets out the challenges facing UK energy policy in the coming years and offers 12 action points to marry security of supply with long term energy sustainability. RenewableUK acknowledges that the Policy paper recognises the need to rebuild the nation’s ageing energy infrastructure and that it offers concrete proposals to increase significantly all types of renewable energy in the UK including wind, wave and tidal generation. It also pledges to ‘promote renewable energy’ with a set of proposals on onshore wind that build on industry best practice, including community benefit, discounted electricity and ringfenced business rates; on marine energy through the development of marine energy parks; and, on a host of other renewable technologies such as biomass, biogas and combined heat and power that should accelerate their deployment. However, the Association is concerned that a Conservative government would abandon the Renewable Obligation (RO) support mechanism, given that it was instrumental in building up the UK’s renewable energy generating capacity, while supporting a range of renewable technologies. Over its lifetime the RO has encouraged the development of over 13GW of wind plant – enough to power close to 8 million households. The recent introduction of banding and a regular review mechanism for the RO means that there is now an effective monitoring mechanism to ensure that ROC values can be adjusted and RO targets kept more closely aligned with delivery, while preserving sufficient incentive to build. Adam Bruce, RenewableUK Chairman, said: “This is a broadly welcome contribution to the debate on the UK’s energy future. Whichever party forms the next government will have a limited timeframe in which to set a clear policy framework within which innovative companies can build the next generation of plant to provide secure and sustainable sources of low carbon energy out to 2050. Particularly welcome in this Paper is the clear commitment to renewable energy in all its forms, including a recognition that greater interconnection will enable the UK to take advantage of new energy markets, bringing added value to consumers. THE announcement earlier that a UK supermarket will be selling the first new vegetable for almost ten years is sure to be seen as good news by veggie lovers keen to try new things. But that news is even better for home gardeners who will be able to grow crops of the new flower-like Brussels sprouts for a fraction of the price. High street retailer Marks & Spencer has hit the headlines with the news they will be stocking the new variety that they have dubbed the “flower sprout”. But gardeners have been able to buy seeds to grow their own Petit Posy brassicas since the latest Thompson & Morgan seed catalog was released in September 2010. 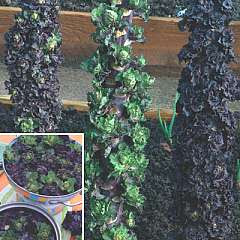 Both Petit Posy and the flower sprout are a unique new variety that is a cross between kale and Brussels sprouts to produce this brand new vegetable. Shoppers will pay £1.99 for 160g of the flower sprout, but could produce enough to last up to five month with a packet of seeds costing just £2.99 from T&M – great news for a cash-strapped Britain that is turning its back on shop bought vegetables in favor of growing at home or the allotment. Gardeners have already shown their enthusiasm for Petit Posy and it is currently one of the best-sellers at T&M in the sprout category. Petit Posy is similar in appearance to both Brussels sprouts and kale but the flavor and nutritional content is very similar to spring greens – perfect for fussy eaters who don't enjoy sprouts! The loose buttons are easy to pick off the stems and are perfect for adding to stir fries, serving steamed or microwaved and make very nutritious winter greens. Extremely winter-hardy, Petit Posy can be sown from late March through to early June and will provide delicious crops from mid-November and into the New Year. This is obviously good news to all of us who want some greens to have throughout the winter season. So far, unfortunately, I have not had an occasion to try this new vegetable but having been “issued” with a sample package of he seeds I will be starting some plugs off rather soon and when the first harvest comes we shall, hopefulness, revisit this vegetable. Sustainable transport charity Sustrans Northern Ireland is calling on the Northern Ireland Assembly to re-direct money earmarked for road-building to get more people walking and cycling, in an effort to curb the province's rising levels of obesity, congestion and social inequality. In its submission to the Regional Development Committee Inquiry into Sustainable Transport on Thursday, March 18, 2010, the charity is proposing a range of measures to get people travelling in ways that are good for their health and the environment. province to get children more active by walking and cycling. By providing a combination of skills training, school travel plans, bike activities and safe routes it is possible to increase levels of active travel amongst children. Previous projects have doubled the numbers of children walking and cycling to and from school. The project would cost around £30m, or under £100 per child over a 10 year period. Encouraging people to change their travel behaviour by supporting people to travel more sustainably and giving every child and young person the knowledge, skills and confidence to establish the habit of travel by foot and bike early in life. Creating safe, attractive walking and cycling conditions by investing in walking and cycling networks in rural and urban areas and redesigning streets to reduce traffic speeds in built up areas to 20mph or less. Increasing public transport usage by improving, integrating services and reducing fares by introducing a national travel card and providing more demand-responsive transport services to people living in rural and urban areas so that they can choose to travel sustainably. Ensuring that planning policy and practice reduce the need to travel by granting planning permission only where high-quality sustainable transport and restricted parking already exist. Reforming taxation and increase spending on sustainable travel by Investing only in schemes and initiatives that reduce high carbon travel and by introducing work and retail place parking levies with revenues invested in improving environments for walking, cycling and public transport. commitment by Government to making this an attractive and safe option is very low. "Half of households in certain areas of Belfast don't have access to a car and so redefining the way people move around is crucial as the NI Assembly aims to deliver a prosperous, healthy, safe, inclusive Northern Ireland. Local journeys are the key to this and we believe that the Assembly should invest in doubling the number of short journeys made by foot, bike and public transport to four out of five by 2020. "This inquiry gives us a golden opportunity to completely overhaul the transport system in Northern Ireland and bring in solutions that will save the tax payer money. by cutting the £500m cost of physical inactivity and obesity and reducing congestion levels predicted to cost £250m per year." Washington, D.C., March 2010 – Black carbon soot, produced from incomplete combustion of diesel fuel and biomass, is one of the largest contributors to climate change apart from CO2, as well as a danger to public health, and should be a prime target of policymakers according to scientists and experts testifying at today’s hearing of the U.S. House Select Committee on Energy Independence and Global Warming chaired by Congressman Edward Markey. Reducing black carbon emissions and other short-term climate forcers such as HFCs, methane, and tropospheric ozone can serve as a complement to CO2 reduction measures, which can take up to 1,000 years to produce significant cooling because of CO2’s long atmospheric lifetime. “A drastic reduction in BC has the potential of offsetting CO2-induced warming for a decade or two. Effectively, BC reduction may provide a possible mechanism for buying time to develop and implement effective steps for reducing CO2 emissions,” said Dr. V. Ramanathan from Scripps Institution of Oceanography at the University of California, San Diego, in his written testimony. Because developed countries have been successful in reducing black carbon emissions in recent years, the technology exists to help developing countries, such as China and India , significantly cut their soot emissions, through diesel-particulate filters for vehicles and cleaner-burning cookstoves. Dr. Ramanathan has spear-headed a program called Project Surya to bring solar cookstoves to India to assist in gathering additional data on the climate forcing potential of black carbon and its impact on local health – emissions of black carbon contribute to respiratory illness, the fourth leading cause of excess mortality in developing countries. Black carbon will also be the topic of discussion at an event hosted by the Woodrow Wilson Center ’s China Environment Forum in D.C. tomorrow, March 17. IGSD’s black carbon expert, Dennis Clare , will participate in “U.S.-China Cooperation: The Co-Benefits of Reducing Black Carbon” along with Dr. Ramanathan and John Guy from the U.S. EPA, to discuss possible ways for the U.S. and China to collaborate on mitigation of black carbon and the major benefits that could be obtained from such collaboration. Garden Organic, the leading charity for organic growing, has teamed up with three GIMA members to bring a new, innovative and exciting initiative that will bring at least 30,000 newcomers into gardening. Last year research showed that the trend for ‘grow your own’ has almost doubled, with 54% of people now choosing to grow food, compared to just 22% two years ago. This trend is set to continue and Garden Organic’s brand new campaign - One Pot Pledge - is set to capitalise on this in 2010. And through the work of GIMA, retailers stand to benefit too. Via the Garden Organic website (www.gardenorganic.org.uk) consumers will be able to register and undertake the pledge of growing at least one pot of something edible at home (or school). Having made the pledge consumers will then be able to access all the cultural instructions they need to grow one of eight suggested crops, specifically selected for pot culture. In the scheme with GIMA members; Suttons Seeds, Stewart Garden and Vital Earth, pledgers will also be able to access a page of money saving coupons against specific products which include seeds, pots and compost, all ideal to help them achieve their pledge. The One Pot Pledge initiative is being launched to GCA Members at their January Conference at the Forest of Arden Hotel and will be launched to the gardening press at the beginning of February. The Garden Organic website which sees over ½ million unique hits every year will promote the campaign heavily and Garden Organic will also be telling its growing e-news subscribers (currently17,000) about the One Pot Pledge, as well as their 40,000 members via their quarterly newsletter circulation. Refuse the plastic knife, fork or spoon; carry your own real cutlery. You go into any kind of deli or food bar and – invariably – especially for takeouts you get presented with – often you haven't even got the choice to refuse – plastic flatware of various kinds, none of which, in general, are biodegradable and all which use resources. While those knives, forks and spoons can – theoretically and practically alike – be washed and reused they do, invariably, in most case, end up in the trash, and in the main this will be in the landfill where they will nigh on never degrade. If you know that you will be getting stuff to eat out from delis and such why not bring your own KFS-set. There are the camping and the military versions that clip together or, alternatively, get some small sets – airline sets can sometimes be had – and then make a snazzy pouch for them and have them on you. That's the environmentally friendly way, In my view. The biggest problem is to be able to – actually – refuse the plastic flatware for, as I have said already, often you do not even get asked as to whether you want the flatware in the same way as there are still stores that just pack your purchase into a plastic carrier bag whether or not you have asked for it. If you then say “but I don't need a bag; I've got my own” they get all on a high horse with “we always pack into bags” or something like that. We need to demand to have the option and it should be “Would you like some flatware” or “would you like a bag” and not the automatic inclosure of flatware with the stuff or the automatic giving of a bag. Not only consumers need educating, I guess. Retailers and other outlets too. How can institutions address the challenges of sustainability? Should organisations take responsibility for cultural change? How can work be redefined to encourage sustainable behaviour? This month, flush with success after winning the Independent Publisher of the Year Award, Earthscan will be broadcasting the first of two Earthcasts addressing sustainable practices in everyday life. In Sustainability & Everyday Life Part 1 the authors of State of the World 2010, The Sustainability Handbook and The Good Work Guide will analyse how institutions can reorganise and drive a cultural shift towards sustainable behaviour. The Earthcast will be full of positive examples from institutions at all levels — the media, education, government, business and religious organizations — and will also discuss how the value of work should be redefined within capitalist organisations to encourage sustainable behaviour. Ultimately it will examine why institutional leaders need to recognise their responsibility to society and align their actions around values that encourage a drive towards sustainability. John Mulrow is the 2009 MAP Sustainable Energy Fellow at the Worldwatch Institute. William R. Blackburn is a lawyer and leading sustainability consultant with three decades of experience. He is president of William Blackburn Consulting, Ltd.
Nick Isles is Editor-in-Chief and Managing Director of Corporate Agenda business advice service. 20% DISCOUNT: Type EARTHCAST into the voucher code box in your shopping cart when ordering any book. "Earthscan is performing a really valuable public service by enabling us all to listen to some the world’s best sustainability consultants and to be able to ask them questions." Surgical equipment used by the British National Health Service (NHS) could be getting made in "unsafe and unfair" working conditions, so medical chiefs have warned. Concerns over the working conditions – including child labor – in Pakistan, where many NHS instruments are produced, have been raised by the British Medical Association (BMA). While, I am sure, we all welcome such call, the truth of the matter is, however, that for many families in countries such as Pakistan, where such instruments are made in small workshops, their children working is a matter of survival. When the children are “employed” in sweatshops then that is a different situation but when they are working with their parents in order that the family can live and not have to starve then this is another. Maybe, just maybe, we must look rather at how little those workers and craftsmen making such instruments are paid for the products and for their labor. Then it may just be possible that they no longer have to reply on the children, some as young as six, working alongside them, in order to make ends meet. It is always so easy to speak about such things and to judge from the comfort of the British clubs but it is a different story out there in Pakistan, or wherever else it may be. So, at age 19, Vince decided to become a New Age traveller and his first home was an old ambulance. Eventually, he was living in a truck that he had converted into a home and he had an entire alternative lifestyle. He had a little wind turbine to charge old batteries and even ran a laptop computer from it. Vince wanted more, however, than to just lead a low-impact lifestyle, so he drove to Cornwall to see Britain’s first wind farm. It gave him the dream of building a wind turbine on the hill where he lived in Gloucestershire. It took five years of challenges and appeals before he managed to get planning permission. The next hurdle Vince was faced with was actually selling the power he generated. The energy sector had not yet been deregulated at that time and the price he was offered to supply the national grid was lower than he wanted. Undaunted by that, however, he came up with a bold solution. He was going to cut out the middleman and supply the customers direct. At that time the electricity industry was just liberalising and it was possible for him to get a supplier licence. The company he created, Ecotricity, has grown rapidly and now incorporates a wind-development arm, which deals with the turbines, and a retail arm, which delivers the energy to customers. In 2007 alone Ecotricity invested £25m in wind energy. In 2007-8 it made a £1.9m profit on £28m sales. It has £37.8m net assets and has been valued at more than £100m. Cautiously, in this difficult climate, we value Vince, 48, at £85m. Green entrepreneurship is possible still today as it was then and all one needs, probably, is vision and the strength of conviction to make it all happen. Locks of Love is a well-known nonprofit organization that accepts donations of human hair to recycle into hairpieces for financially disadvantaged children suffering from medical hair loss. But I guess those bits of hair have to be rather substantial. However, now even smaller quantities of human hair – including much of what used to end up in the barbershop’s wastebasket – are being recycled into a variety of gardening products that encourage healthy plant life and naturally deter unwanted pests in the garden. In addition to that human hair can be composted as well. However, presently, most human hair that ends up in the barber's waste basket goes nowhere else but the landfill sites. They have also looked at using, and have successfully done so, mats made from human hair to soak up – if that is the right word for it – oil spills at sea. Apparently it works and is the only thing that really works. If you happen to cut your own hair (and that of your family), as I do, then do consider putting the clippings into the composting bin and not into the waste stream. Cutting your own hair saves lots of money, I can attest to that, especially, when like me, you manage to acquire a new hair-clipping machine at a Thrift Store for less than $10. Considering that every visit to the barbers would be at least $10 and that about once every three weeks the savings are phenomenal. Plus, I get to keep the clippings to add to the compost. ...a humanitarian aid operation or an invasion/occupation? Think for yourselves in order to answer this question. Thousands of US Marines, Rangers, and Sailors on Haiti or in Haitian waters are not the numbers that you would expect for a humanitarian relief operation but, on the other hand, those numbers are just right if invasion and occupation is the aim and name of the game. The majority of the survivors of the Haitian earthquake have still not, in the beginning of March 2010, seen any or much aid distributed to them but have seen lots of US troops moving about. When the helicopters landed – Cobras and Apaches – the troops that disembarked took up standard landing zone protection and defense positions. Those are the procedures used only on two occasions; namely when you are expecting opposition and incoming hostile fire or when you try to intimidate the locals. We have n ow learned that someone is hiring “security” personnel to go to Haiti and according to one of our sources, who has been approached by the recruiters, it is a “hired guns” job and well paid too. So, I ask, what is going on? It all points towards something other completely than a humanitarian relief operation and that despite the fact that the hospital ship is being used to treat some of the most severely injured survivors of the earthquake. However, we must look at the strategic location of Haiti. On one side is a basic puppet of Washington anyway – the Dominican Republic – and with Haiti too in US hands the island is just what is needed. Haiti lied directly opposite a rather large Caribbean island – the largest, I believe – namely Cuba and in fact directly opposite of Guantanamo. Then, just across the water there is a country that the US would love to lay their hands on; Venezuela and the reason is yet again that evil smelling stuff for which the war in Iraq has been fought, oil. While, and I am very much aware of this, there are no direct messages to this effect, that is to say as to an pincer attack on Venezuela, around the fact seem to speak volumes, and should do so to any serious analyst of the situation. Someone asked the other day on an Internet forum ad to which country was going to be next after Iraq and Afghanistan in the cross hairs of the US military and no one was looking, it would appear, as close to home as Haiti. However, in my mind, all the signs speak for the earthquake in Haiti having come to them like a gift of the g-ds, giving the US military a way to get in without any questions. For most of a day and more aid planes from other sources could not land on the airport of Port-au-Prince because all US military air traffic had priority and the controllers, who were placed there by the US military, made that absolutely clear. It is such fact that, in my mind, make the intentions absolutely clear and the US could not have wished for better. Someone with a very suspicious mind might actually wonder and ask as to whether the earthquake might not have, actually, have been triggered by something other than natural forces, but the situation, whichever way, led to what we have now; US forces in their thousands on Haiti or in Haitian waters. A series of 'cycle to work or university' days have been lined up in March to encourage staff and students in Nottingham to start pedaling their way to fitness. The cycling sessions are part of Ucycle Nottingham, a project delivered by sustainable transport charity Sustrans, in partnership with The University of Nottingham, Nottingham Trent University , Nottingham University Hospitals NHS Trust, Nottingham City Council, Cycling England and The Big Wheel. As part of the project, staff and students in Nottingham are being urged to make an online pledge to cycle more of their everyday journeys to work and university to benefit their health and the environment. In return for making a pledge, staff and students will receive a free breakfast and gift once they have commuted their journey by bike during one of the cycling sessions. Sustrans' Project Manager, Joanna Ward, said: "The 'cycle to work or university' days have been organised to give staff and students an opportunity to make a difference to their overall fitness levels, whether they're new to cycling or have been pedaling for years. "Cycling is one of the easiest, most affordable and convenient ways to get fit and healthy whilst commuting from A to B, making it ideal for staff and students to travel through the city to get to meetings and lectures. "We are hoping that the free breakfasts and gifts will help to motivate people to take to the saddle as part of their everyday travel needs. During the series of cycling sessions, a Dr Bike will be on hand to offer staff and students a free bike maintenance check and cycling information will be freely available". The acquisition of new business premises, with associated facilities for its members, heralds a new era for CIWEM. Existing houses and non-domestic buildings are responsible for over 40 percent of the UK’s total carbon emissions. In CIWEM’s recently published Manifesto, the Institution called for the development of clear codes of practice for construction and retrofit of new and existing non-domestic buildings and homes, with a phased tightening of standards to improve their environmental performance. Now CIWEM is leading by example. The Institution’s new head office at Saffron Hill, London will be refurbished to BREEAM standards with the aim of making it an exemplar eco-build project. Emphasis will be placed upon the quality of design and construction. The premises has excellent transport links, located in an area of active regeneration that is part of the London Crossrail development, and is due for completion towards the end of 2011. Saffron Hill will provide conference and meeting facilities, exhibition space and will build on CIWEM’s reputation as a progressive and forward looking Institution. Under the slogan “Be Prepared – To Vote” the Scout Association has launched a campaign to encourage young people to vote, amid fears that over half may not be on the electoral roll. Around 10,000 Scouts will be eligible to cast their ballot for the first time in a general election this year and a website has been set up to encourage them and others to do so. Earlier this month, the Electoral Commission found that 56% of those aged between 17 and 24 in eight selected areas were not registered to vote. The Scout Association's Active Citizen website explains why politics matters to young people, alongside advice on registering and volunteering and a includes a forum for politicians to take part in online discussions with young voters. The association is also sending information by post to 50,000 members in an attempt to boost turnout. Wayne Bulpitt, The Scout Association's UK chief commissioner said: "In scouting we believe it is extremely important for young people to engage in democracy. Every vote counts. We not only want our young members to see why they should vote but how politics impacts on the causes and concerns that they have." Young people can register to vote from the age of 16, although they are not be able to actually vote until they are 18. The sad thing is that so many people gave their lives and their freedom for our right to have a voice and a vote and so many, nowadays, of all ages able to vote have not inclination to do so and make use of their democratic right to cast their ballot. The question of not as to whether the candidate(s) on the ballot paper is your chosen one. Spoil the ballot, if you have to, but make your voice heard somehow. On the other hand the government must also actually be made to understand that, if only 30-40% of the electorate turn out to vote they do not, in fact, have a legitimate right for power. There have been a majority that have cast a silent vote, saying that they feel disenfranchised and hence any party that is elected with say 55% out just less than half of all voters casting their votes cannot claim that they have the right to form a government. In fact they only have received the votes of less than a quarter of the electorate. Either we have a democracy or we do not and the way all ballots go in Britain, for instance, we do not seem to and this is the same for government elections, local and central as, for instance, elections for trade union bodies. The Australians have the right attitude where going top the polls is mandatory. That was the great majority is counted and thus the election can be seen as more or less democratic. Time we all woke up and time we actually used our vote and voice. Washington, D.C., March 2010 – Significant amounts of methane found to be leaking from permafrost in the East Siberian Arctic Shelf could push the world closer to the tipping points for abrupt climate changes. According to a study published in Science journal this week, about 7-8 million tonnes of methane are being released from the Shelf each year – about the same amount that the entire world’s oceans release annually. Methane is a potent greenhouse gas considered to be one of the largest contributors to climate change. The fear is that should these leaks turn out to be new, due to rising temperatures, it’s possible that considerably larger pockets of methane will be released from thawing permafrost. Further studies will be necessary to determine whether the methane leaks are due to global warming. These fast-action measures include reducing emissions of short-lived climate forcers such as black carbon soot, tropospheric ozone, and methane produced from activities such as agriculture, coal mining, and production of oil and natural gas. Because they are short-lived, implementing aggressive mitigation measures can lead to major near-term climate benefits. Expanding biochar production to sequester carbon and increasing urban albedo to reflect solar radiation are also important strategies to reduce the possibility of passing tipping points. A 2008 study on methane funded by the National Science Foundation found that over 600 million years ago, a sudden release of methane from ice sheets set in motion an abrupt change in climate, transforming the Earth from a cold environment into a much warmer one. While the scientists involved in the study noted that there is no way to determine how much methane it would take to reach that threshold, the current trend of rising emissions is deeply troubling. As wind power generation continues to expand around the world, a new estimate by the National Renewable Energy Laboratory shows that America has even more untapped wind resources than previously thought. But will we capitalize on it? Worldwide, wind power breezed through the tough economic times last year. According to the Global Wind Energy Council, some 37.5 gigawatts of wind power capacity was added to the global energy mix in 2009, an increase of almost a third. The American Wind Energy Association reports that the U.S. didn't do too shabby itself, installing a record-breaking 10 GW of new wind power, bringing total wind capacity up to 35 GW. But, per the revised estimates just released by the NREL, America has the potential capacity of 10,000 GW. That's equivalent to 37 million gigawatt-hours every year, more than nine times the amount of energy consumed by Americans. And that’s just onshore wind resources — add in offshore and high altitude wind resources, and that number would grow exponentially. Given the fact that we’re using a mere fraction of our vast wind resources — and considering how many jobs the wind industry could create with a little support from the federal government — you’d think we were going all in with the wind, right? Not so much. The biggest holdup is the lack of an ambitious national Renewable Energy Standard. Without it, there is too much uncertainty about whether or not the wind industry will become competitive against the fossil fuels industry — which does receive major subsidies from the federal government — making potential investors weary. Establishing a national target of 25 percent renewable energy by 2025 would also create 274,000 new jobs. The two renewable energy standards on the table, however, fall well short of that mark. The RESs outlined in the House and Senate climate bills call for 20 percent and 15 percent renewables by 2020, respectively. And even those targets are soft, as both bills would allow efficiency measures to be substituted for renewable energy in some cases. This means that the national standards called for by the House and Senate bills would likely result in less renewable energy than we’d already achieve anyway under state renewable energy standards. There are a host of other factors blocking development of wind energy: our continued reliance on, and massive subsidies for, fossil fuels; deliberate obstruction and misinformation campaigns orchestrated by the fossil fuel industries that would lose money if we switched to renewables; and NIMBYism, to name a few. Most of these have been brought to bear on the Cape Wind project, which would be the first large-scale offshore wind project in America if it was completed. It will have a significant effect on the future of wind power in the country, one way or another. As Americans, we have the opportunity to choose what our energy future will be. Will we choose to build a clean, healthy future on renewable energy — and create jobs to boot — or will we stick with the dirty, polluting energy sources of the past? The Environment Agency estimates that 1.5 percent of the UK’s electricity needs could be generated through hydropower schemes. CIWEM and the EA will be examining the challenges in the planning and delivery of hydropower schemes at their joint conference Hydropower - Opportunities, Challenges and Sharing Best Practice. Every potential hydropower site is different as there are considerable variations in hydrology, terrestrial and aquatic ecology, fisheries and flood risk between different sites. This means that a one-size-fits-all approach to managing their impacts is not feasible, but a consistent assessment framework is essential. Poorly designed hydropower schemes can have serious impacts on the local river environment, particularly on fish populations, and on flood risk for properties downstream of the installation. In August 2009, the Environment Agency published Good Practice Guidance for small-scale hydropower schemes, providing clear guidance for developers on how schemes should be designed to meet environmental and flood risk legislation. The Environment Agency is now in the process of reviewing the document and wishes to gather feedback from its use to inform the publication of an updated version later this year. A major programme of work also has been launched by the Environment Agency to support the sustainable development of hydropower to ensure that permit applications are dealt with rapidly and efficiently. The aim of this conference is to provide delegates with an update on the current progress, including identifying new opportunities, tackling environmental challenges and streamlining the permitting process. The keynote address will be given by EA Chairman Lord Chris Smith and will include presentations from The Angling Trust and the British Hydropower. Hydropower - Opportunities, Challenges and Sharing Best Practice is relevant for regulators, developers, environmental practitioners, consultants, scientists and engineers and will take place on 23rd June at SOAS, London. David Milliband, the British foreign secretary, on Tuesday, March 23, 2010, expelled an Israeli diplomat in the row over the cloning of 12 British passports by the Israeli security service, MOSSAD, used for the assassins of a Hamas commander in the UAE. It would appear that the diplomat expelled was, in fact, the most senior MOSSAD resident in the UK, and though we do not know as to whether he himself has or has not had his hands in the cloning of the British passports that have been used by the assassins, it is a move that must be commended. It is about time that the British government not only expelled this diplomat and his ilk but that they cut all ties with the Zionist entity in Palestine, at least until such a time that that country behaves as it should. We cannot permit any country to do what Israel has done in cloning passports of British and other countries' citizens putting those innocent people in serious risk of life and limb. Had this been done, for instance, by Russia, or other, once seen more as enemy countries, we can safely assume that a lot of noises would have been made, in public and behind the scenes. However, when it comes to the Zionist entity in Palestine no one dares to say anything, or so at least it would appear. David Milliband, though, seems to have, finally, found the courage to actually do something. MOSSAD has been doing things int his country that would have gotten diplomatic ties cut with many an other country, but, when it comes to Israel, that Zionist state, it seems that people are afraid to touch them. The Jews seem to have immunity from prosecution, it would appear. Even the Gestapo was not as good as MOSSAD and the other agencies of the Zionist state, which uses the same methods the Nazis used. Guess they read all the old manuals and just added to it. While any other country would be condemned by the West for what the Zionists do to the Palestinians, Israel is allowed to get away with it. Slower traffic speeds, quieter streets and more attractive neighbourhoods are just some of the results from a pilot scheme has been celebrated at a Bristol-based conference held by sustainable transport charity, Sustrans. The conference has reviewed the work and results of Sustrans' DIY Streets pilot projects carried out in London , South Wales, Coventry , Manchester , Sheffield, Torquay and Oxford. Launched in 2007, the 11 pilot projects have encouraged communities in these areas to re-design their own streets affordably to make them safer, cleaner and more people-friendly. The scheme follows the successes of home zones and aims to create more attractive spaces at a lower cost and with communities driving the process. Sustrans has gathered interim results* from six of the 11 streets through a residents' survey to determine the success of the scheme. 69% of residents agree that their street is greener and more attractive following the project and 76% feel there has been a reduction in the amount of traffic using their street. Over half the residents surveyed also feel cars are moving slower past their homes and 43% believe their street is now a safer environment in which children can play. This result has increased significantly from 8% of residents before the project was carried out. Residents involved in the projects include Adrian Holliday who lives in Hackney and is part of the Clapton Terrace Residents' Association. Commenting on the success of the project on his street, Adrian said: "There has been a real sense of enthusiasm among all residents in the neighbourhood and we have been delighted to see such improvements made to the safety and overall look of our street. "The volume of trolley bins and rubbish on Clapton Terrace was the biggest problem for all residents. Through the project, we replaced 53 trolley bins with a few communal rubbish bins which made a huge difference to the appearance of our street." Alexandra Allen, Project Director at Sustrans, said: "The whole team is really encouraged by such positive interim results. One of the main objectives of the scheme was to test whether we could achieve many of the benefits of home zones but in a cost-effective way. One of the key aspects we kept from home zones was having residents at the centre of the process. "These results show us that residents are responding to the project in the same way as communities did to home zones, only less money has been spent in the re-design of urban areas through DIY Streets." Peter Lipman, Policy Director at Sustrans and keynote speaker at the conference, said: "The evaluation results will help Sustrans shape the next steps ahead for achieving its vision of creating safer and more attractive streets in communities across the UK . Safer streets mean a greater sense of community engagement, more children enjoying play activities outside, and better walking and cycling conditions in local areas." The Sustrans scheme has been part-funded by the Esmée Fairbairn Foundation, local authorities and housing associations along with additional funding from Transport For London for projects carried out in the Capital. The WATER project, coordinated by WWF, STEO and WWT and funded by the European Commission, promotes wetland technology as a sustainable solution for water purification for Vientiane, Laos, bringing additional benefits for flood control, biodiversity and for the people reliant on marsh products. The That Luang Marsh, sited on the eastern edge of Vientiane, has traditionally provided vital services for the city through flood prevention, wastewater treatment and livelihood support which have been valued at USD$5 million annually. Threats from unregulated urban expansion, increases in discharges from industry and untreated domestic wastewater are reducing the capacity of the marsh to provide these services. The project demonstrated that an integrated wastewater management approach may be the most appropriate. The approach involved the production of designs for large-scale treatment wetlands within the marsh to treat wastewater from a catchment of 250,000 people; maintenance of the marsh for flood storage, water purification, biodiversity and food production through the production of an adaptive wetland management plan; and the construction of smaller scale wetlands designed to target industrial and domestic wastewater at source before it enters the cities network of ditches and canals leading to the marsh. For those interested in finding out more, Dr Sally Mackenzie from Wildfowl & Wetlands Trust, Dr Matthew Simpson from WWT Consulting and Pauline Gerrard from WWF Laos will be presenting Wastewater treatment through effective wetland management of That Luang Marsh (WATER), Vientiane, Laos at Water & Environment 2010: CIWEM’s Annual Conference on 28th April at the Olympia Conference Centre, London. For more information, go to http://www.ciwem.org/events/annual_conference. The ‘Say No To Phonebooks’ campaign, sponsored by 192.com, is claiming two victories this week with the Local Government Association (LGA) declaring ‘war on pointless phone directories’ and Yellow Pages announcing that its directories will be smaller in future. With 7,700 signatures already obtained on the ‘Say No To Phonebooks’ Downing St e-petition, the LGA is calling on the public to opt-out of receiving phonebooks to reduce the £7.5 million that’s spent on their collection and disposal. Tax payers and local government are making a stand against this illegitimate waste of council funds. At the same time, Yellow Pages has announced a change to its directories, the most significant in 40 years, which will shrink the directory five centimetres in height and four centimetres in width, whilst retaining the same number of pages. The reduction in size has no doubt come about as a response to public disquiet about the environmental impact that phonebooks have. This should reduce the annual waste produced by Yellow Pages directories by a third, however, independent research indicates that 41% of households no longer use printed directories at all. If just this 41% were to no longer automatically receive phonebooks it would save 25,420 tonnes of annual waste that currently needs to be managed by local councils. This is almost four times the saving of Yell’s directory resize and therefore would be significantly more beneficial to the environment and the tax payer, without any impact to consumers. These figures don’t take into account the energy, oil and water that are wasted in the production, delivery and recycling process. For this reason, ‘Say No To Phonebooks’ campaigners believe Yell and the LGA haven’t gone far enough and maintain that all printed directories, including those from Yell, BT and Thomson Local, should be available on request and not delivered automatically. Furthermore, Yell has claimed that the new size of its directories will make them small enough to fit through letter boxes. If this is the case, ‘Say No To Phonebooks’ campaigners would like clarification as to whether Yell will respect ‘No Junk Mail’ stickers on letter boxes, something that it seems to currently ignore. Dominic Blackburn, Product Director, 192.com said, “We are finally starting to see directories reluctantly take notice of the ‘Say No To Phonebooks’ campaign particularly as local government weighs in on the debate. However, we must not to be placated by piecemeal moves towards a more environmentally friendly solution. People need to make their voice heard and sign the Downing St e-petition against phonebooks so that we can get the outdated system changed once and for all”. Those that believe that a government trying to reduce unnecessary waste and energy consumption should start with the millions of unwanted phonebooks that are delivered each year should sign the e-petition on the Downing St website (http://petitions.number10.gov.uk/NoPhonebooks/) before the 31st March 2010. Campaign supporters can also follow activity on Twitter, Facebook and YouTube. Find out more at www.saynotophonebooks.org. 192.com is the UK’s most awarded online directory, helping find people, businesses and places for millions of users every month. On 192.com, users can search almost 700 million records including free directory enquiries, edited electoral roll information, local business listings, interactive mapping, aerial photography and property prices. There is an obvious conflict of interest here as far as the campaign being run by 192.com in that this directory is an online business and charges for a more in-depth search and the general paper directories are free – well, sort of. However, who wants those big paper things still? On the other hand though we must not forget that there are still people in Britain, as well as in the USA and Canada, though the latter two are not part of this, that do not have computers and the Internet. Many older people, for instance, have neither computer nor Internet and could end up being discriminated against and having to pay to find a phone number. So, while it may seem a very nice green idea and one that would save trees from being turned into, for many people nowadays, useless books, that have to be recycled somehow afterwards and often do not get recycled but end up in landfill sites, it may leave a number of people disadvantaged and out of pocket. We have to look at this very, very carefully, methinks. Well known as one of the UK’s largest suppliers of plug plants, seeds, bulbs and accessories to the consumer market via mail order and online sales, Gardening Direct has donated a large quantity of bean seeds to Thrive, the charity that uses gardening to help disabled people, for a new national competition to be called BeanFest 2010. Says Gardening Direct Product Development Director Tony Milne “We are delighted to be working with Thrive on the BeanFest competition. If just one disabled person discovers the joy of gardening through planting our seeds and watching the plants grow, it will all be worthwhile. Nicola Carruthers, Chief Executive, Thrive added “Gardening can change people’s lives by making them feel happier, more confident and healthier in so many ways. It not only improves emotional health through being outdoors and working with plants but also physical health. We hope that this competition will reward and recognise disabled gardeners skills and achievements and encourage others to carry on or take up gardening. The bean seeds have been distributed to groups of people Thrive works with including garden projects that work with disabled people and people affected by stroke or heart disease across the UK. If you work with disabled people or are disabled yourself and would like to enter this competition, please call Thrive on 0118 988 5688 for your two free packets of bean seeds and the competition guidelines. The BeanFest 2010 competition is to win free plants to the value of £200 from Gardening Direct. Competitors have been given instructions on how to plant the beans for optimum growth and tips on choosing an unusual container. By the closing date of Monday 12 July, entrants need to send in details of themselves along with photographs of the beans, the container and the group involved in growing the seeds. The judging will be held at the Thrive’s Trunkwell Flower Show in Reading on July 15. Thrive is a small national charity which enables those touched by a disability to transform their lives through gardening. Thrive uses gardening to help improve the quality of life for those with dementia and mental health issues, rebuild people’s life after strokes, accidents or a heart attack and helps people to carry on gardening as they get older. For more information go to www.thrive.org.uk and www.carryongardening.org.uk. With a vision to enable those touched by a disability to transform their lives using gardening, activities are focussed on championing the benefits of gardening to individuals and organisations, as well as teaching techniques and practical applications so that anyone with a disability can enjoy gardening. The world's largest spade has been built by British manufacturer, Bulldog Tools to celebrate its 230 year anniversary. The spade weighs approximately 180KG (28st 4.8lb), stands at 3.610 metres (11'8'') height, has a blade of 598mm (23 ½”) wide and took 160 man hours to put together. It beats the former world's largest spade by 500mm in height and has been verified by Guinness World Records. Assembled in Wigan, the spade is a testament to the capabilities of those who work at the Bulldog factory, the last working forge in the UK. Bulldog Tools, based in Wigan, has manufactured spades and forks of outstanding quality for 230 years. Using skilled craftsmen with generations of experience, Bulldog Tools has maintained its ability to create products of the highest standards. The Bulldog Tools factory is the only full time working forge still making spades and forks within the UK, producing over 2000 garden and contractors tools every day. Bulldog Tools is proud to be British. Currently employing 65 people, Bulldog Tools is part of and helps support the local Wigan economy. The regulatory regime for the water industry has played a major role in securing service and environmental improvements and increased efficiency. However, following on from a recent CIWEM conference where 87 percent of delegates supported a comprehensive review of the financial regulation of water, a presentation at Water & Environment 2010: CIWEM’s Annual Conference will address how the framework needs to develop to respond to the new challenges facing the industry, in particular to encourage long-term sustainable solutions and meet the challenge of climate change. Frank Grimshaw and Min Bansel from Severn Trent Water will look at how to improve the framework to ensure that the right outcomes are achieved for customers and the environment, including incentive mechanisms to promote service improvement and sustainable solutions, and to encourage production of robust business plans. They will also review innovations for PR09, including the new Capital Expenditure Incentive Scheme, carbon accounting and the widespread use of cost-benefit analysis. For those interested in finding out about sustainable regulation within the water industry, Frank Grimshaw and Min Bansel will be giving a presentation at Water & Environment 2010: CIWEM’s Annual Conference on the 29th April at the Olympia Conference Centre, London. For more information, go to http://www.ciwem.org/events/annual_conference. These small, lightweight tools have shorter shafts and smaller heads making them ideal for working in confined areas, raised beds or for shorter gardeners or children. The polished, stainless steel is easily cleaned and the forward tilting handles have a comfortable soft grip. To review stand here the ATSSS Stainless Shrubbery Spade and the ATSSS Stainless Shrubbery Fork and I must say that, although I should not have been, I guess, seeing those are Bulldog tools, more than amazed as to the quality of this spade and fork. The fork and the spade are the best balanced ones that I have, so far, ever encountered and they are an absolute pleasure to use. They are as balanced as they should be but rarely do we find that spades and forks are properly balanced today. The spade, to my great surprise, comes actually with a sharpened ground edge, which is something rarely seen nowadays too. The spade and fork both handle like a dream and are, and that is where they were in fact designed for, ideal for children and young people to introduce them to serious gardening. Adult tools – per se – are too large for them to use them comfortably and safely while many children's and junior gardening tools just are more gimmicks than anything. They are also brilliant for use in, as said in the beginning, confined areas, raised beds, etc., making them ideal companions also for those of use who do their vegetable gardening in raised beds and primarily containers of sorts. Those tools have been developed by Bulldog together with Alan Titchmarsh and this cooperation really has brought out some brilliant tools, and brilliant not just because of the mirror polished stainless steel and I can definitely endorse those tools. These are yet some more great products from the Bulldog forge in Wigan. But then again quality has been synonymous with Bulldog for the last 230 years. Delegates at Water & Environment 2010: CIWEM’s Annual Conference will be some of the first to find out about an innovative project that is bringing the UK its first climate change public park. A partnership of TRRT, London Borough of Barking, EA, NE, GLA, Design for London and LWT formed to deliver a 45 hectare climate change park in Barking, East London. The work included restoring one kilometre of the Mayes Brook and creating a one hectare floodplain to increase flood water storage and the resilience of the river to floods and droughts, reduce pollution, increase connectivity along the river corridor and increase biodiversity. The project’s main aim is to provide a sustainable, innovative and inspiring greenspace for local people to enjoy. Park designers hope to make Mayesbrook Park into a shining example of how green spaces can be enhanced to cope with climate change and make it more suitable for wildlife and people. WWF will also use the Mayesbrook restoration as an example of how SUDS can help deliver natural flood management, improved water quality and other benefits in an urban area. For those interested in finding out more, Robert Oates, Director, Thames Rivers Restoration Trust and Rebecca O'Shea, Conservation Team Leader, Environment Agency will be presenting Mayesbrook - the UK's first climate change adaptation public park at Water & Environment 2010: CIWEM’s Annual Conference on 29th April at the Olympia Conference Centre, London. For more information, go to http://www.ciwem.org/events/annual_conference. Many reservoirs in Great Britain lie immediately upstream of, or adjacent to, heavily populated areas. Flooding from reservoirs can result from an uncontrolled breach of the dam or overtopping during severe rainfall, with catastrophic consequences for life, property, critical infrastructures and economies. In his report on the summer 2007 floods, Sir Michael Pitt made a series of recommendations to improve response to flooding which included inundation maps that show the result of dam failure to be available for emergency services. Defra instructed the Environment Agency to produce simplified reservoir inundation maps for all 2,092 large raised reservoirs in England and Wales. The inundation maps will show the effects on the downstream catchment of a dam breach, showing flood extent, depth, velocity, hazard level, time of initial inundation and time of peak arrival. Such information will allow emergency planners to provide a site-specific response, including the establishment of emergency procedures for the evacuation and control of populated areas below dams which could be used to save lives and reduce injury in the event of a dam failure. Two presentations at Water & Environment 2010: CIWEM’s Annual Conference will explore the issues surrounding reservoir safety. Sun Yan Evans, Principal Engineer at Mott MacDonald and Andy Hohl, Project Manager at the Environment Agency will describe the key stages, challenges and achievements involved in delivering the National Reservoir Inundation Mapping (NRIM) programme, including the Trial, Pilot Study, and Phases 1 and 2. Following on, Ian Hope, Technical Manager, Reservoir Safety, Environment Agency will describe the development of inundation maps and emergency plan templates and their part in the overall emergency planning for reservoirs. He will also highlight the essential role of warning and informing the public which is to be carried out as part of the introduction of these plans. For those interested in finding out more, both Sun Yan Evans, Principal Engineer at Mott MacDonald and Andy Hohl, Project Manager at the Environment Agency, and Ian Hope, Technical Manager, Reservoir Safety, Environment Agency will be giving presentations at Water & Environment 2010: CIWEM’s Annual Conference on the 29th April at the Olympia Conference Centre, London. For more information, go to http://www.ciwem.org/events/annual_conference. The more we look at China the more we must come to the conclusion that we, the so-called “free” world, should stop doing business with them, period. This would also be better for our economies and the Planet. The latest in the saga is now that all SMS messages in China are being screened and subscribers cut off if the government censors do not like the contents of the message. Mind you, the way things are going with surveillance of this kind in The UK, Germany and such, we are not far behind this either. And it is not just the CCTV surveillance in Britain and Germany that I am talking about; the Internet surveillance in Germany is bad as well, with the possibility of getting cut off from Internet supply if the powers that be decide that someone is “up to something”. The Bundestrojaner that was in discussion a while back was something even more sinister in that it was a Trojan that was to be placed in all PCs in Germany so that the German Federal Police would be able to check as to what someone has on his or her computer. Welcome to the New Germany. Hitler had nothing on them. The danger and worry for us in the European Union must be that what is being started in Germany (and Britain) may become the norm throughout the EU and we will all be forced to live under such a regime. China has a record that certainly is a bad one and our developed home countries should not be involved there as regards to business dealings and having everything manufactured there. The way the global companies, mostly based in the West, do business in China it could be seen as an endorsement for the system and in many ways it actually is. We have allowed China to take over too in many places, such as the USA and Canada. China now owns the greatest share in the Alberta Tar Sands and we can certainly guarantee therefore that the environment will not be taken account of; not that the Canadian companies and other have cared for the environment in the process of the exploitation of the Tar Sands. Rather the opposite. We are losing one manufacturing place after the other and it is all going to China, in the main, with one or two moving to Hungary and the likes. This is not good; not good for our economy and not good for our security, whether goods and services or energy, etc. Most computers, their components and peripherals are, nowadays, made in China and hence we, who use all that equipment, have become rather dependent on that country for our needs in that field. When it comes to security on that level who could tell as to whether the Chinese do not put something into the hardware that, in fact, actually may “call home”. In short, and also with view of the possibility that the Chinese bubble is going to burst in the not so distant future, we must bring our businesses home so that we have security in production and products. It may then also be possible to create products that last, that are repairable, and such, making it possible for us to get away from the “throw away society” that we are at present. Our economy should also not be measured on how much is being sold annually or such; that is to say on growth due to products being designed to fail in a short time. Rather we must look at a different approach to measuring as to how healthy our economy is. Outsourcing is not a good option for a county's economy; only for a global one, and we then give succor to regimes like the one in China. If need rather swap the Chinese Dragon for the Indian Tiger. At least India is a democracy and human rights are somewhat better than in China. On the other hand, however, we must rather bring our industries back home in order to, actually, get back some security of products in the same way as this must be done as regards to agriculture as to food security. Two world wars should have taught Britain a thing or two as to food security and also security of manufactured goods but, it would appear, that it has not. Utilities too must be taken back out of the hands of foreign companies and interests and be taken back into public ownership. Only thus can energy and water be secured for the people of the country. I do not know how many British utilities are owned by China but most, if not indeed all, of our electricity generating capacity if foreign owned, whether it be by EDF, or by E-On or RWE, as in the case of N-Power. The latter regardless of whether their salespeople will, falsely, claim to be a British green energy company. Nothing could be further from the truth. Many of the British water companies are also foreign owned; by American, French and nationalities. Again, whether China has its fingers in it I do not know for sure but in there are rumors. This must stop and the same for the transport infrastructure, whether it be toll roads and toll bridges, the railroads, ports and airports. A country must not allow such infrastructure to be owned by outside sources, regardless of whether or not those entities are from friendly powers or not. And here with this I will rest my case (for the moment). Yellow Pages directories are to undergo their most significant revamp in more than forty years since they were first produced in the UK , with their publication in a smaller compact size rather than traditional A4 format. The change in size – a reduction of five centimetres in height and four centimetres in width – follows research amongst Yellow Pages users that revealed that the compact directory increased usage by seven per cent compared with the A4 format. An overwhelming number – 85 per cent – said they would prefer to receive a compact format directory rather than a standard A4 size. In tests, a greater proportion of compact users than A4 users agreed it was easy to read, easy to use and a manageable size. The reduction in size is being introduced for Yellow Pages directories published from the end of June this year and is a key element of a package of directory design changes to enhance ease of use. These also include a new “local listings” feature making it easier for consumers to find a business in their desired location. The new compact format incorporates a font specially-selected to enhance the smaller directory’s readability. The overall number of pages in each edition will remain similar to the traditional A4 format, but its reduced height and width means it will be small enough to fit through standard size letter boxes at households and businesses. Jason Smith, director of printed products at Yell which publishes Yellow Pages directories, said: “This is an important step for Yellow Pages, meeting the changing requirements and preferences of our consumers when searching for local businesses in their area. Production of the smaller, compact directory including the paper used will maintain Yell’s widely acknowledged track record with regard to the environment. Yellow Pages directories contain on average 54 per cent recycled fibre content with the virgin pulp comprising the rest of the directory sourced from sustainably managed forests. All old Yellow Pages directories are 100 per cent recyclable. The reduction in size means a reduction in the paper used in the new directories’ production, and there will be additional benefits, for instance relating to the operational resource used in their delivery. Hong Kong is the only place in the world that uses seawater to flush toilets in an extensive scale. Hong Kong is an Asian city with nearly 7 million people. Because of the lack of natural resources, the local water supply is not adequate to meet the demand. Fresh water supply in Hong Kong relies on the cross border import of water from the East River in China. Therefore, to conserve fresh water, seawater has been used for toilet flushing since the 1950s. Seawater is abstracted at the seafront pumping stations for treatment before supply, although it is not treated to the same standard as fresh water. About 80 percent of the population is provided with seawater for toilet flushing, thus effectively reducing the fresh water demand by as much as 20 percent. Provided that fundamental precautions are taken, a seawater supply system is technically not much more difficult to construct, operate and maintain than any other reticulation systems. And seawater toilet flushing is found to be a considerably cheaper alternative to using. However, difficulties encountered in operating such a system include the generation of saline wastewater, which is more difficult to treat in sewage treatment works, and the corrosion of pipelines and equipment. For those interested in finding out about the difficulties and solutions to these problems, Dr. S.L. Tang and Derek P.T. Yue of The Hong Kong Polytechnic University will be giving a presentation at Water & Environment 2010: CIWEM’s Annual Conference on the 29th April at the Olympia Conference Centre, London. For more information, go to http://www.ciwem.org/events/annual_conference. Desalination can provide significant benefits to communities that have depleted or limited access to traditional ground or surface water supplies. However, it can be an extremely costly technology and key challenges include minimising energy consumption and environmental impacts. Two papers at CIWEM’s Annual Conference 2010 will be addressing the issues by examining Adelaide's first desalination plant currently being constructed at Port Stanvac and the proposed Thames Estuary plant. In 2002, Thames Water began to give serious consideration to building the first municipal desalination plant on the British mainland near the Thames Estuary. Ofwat agreed with Thames Water’s assessment that they had a supply demand deficit under sustained dry conditions and that there was little alternative but to develop a desalination scheme. However Ken Livingstone, then the Mayor of London, challenged the decision. His view was that Thames Water should improve their leakage performance, manage demand and consider less environmentally damaging options for meeting any shortfall, principally wastewater reuse. Dr Graeme K Pearce of Membrane Consultancy Associates Ltd will provide an independent assessment of this conflict, comparing the energy use of treating different sources and examining issues regarding the sustainability of desalination. In contrast, environmental consultant Mott MacDonald will present a paper looking at how Adelaide’s desalination plant will provide the city with around 25 percent of its water supply needs. The 300 Ml/d desalination plant will be operational by December 2010, preserving the water supply to the city. The paper will explore the environmental and technical issues associated with the project and describe how it was delivered. Desalination will, I believe, become a very important issue for us in the future. While it rains a lot in Britain, for some reason we are very susceptible to drought, but this is not so much due to lack of rainfall – though there have been times in the previous years where parts of the year have been drier than usual. This seems to be changing, once again, though and we seem to – unless it is just a perception – more rain now in the last year or so, than we know what to do with – judging by the floods that occurred in a number of places. The problem for the South of the country is, however, that the pressure on the traditional sources of drinking water are far too great due to way too many people and businesses clustering in London and the Home Counties. Desalination could be the answer here and Thames Water should be given the go ahead to build the plant that they have in mind. In addition to that, however, the first port of call must be repair of the leaky mains which lose us millions of gallons of water annually into the soil. Water & Environment 2010: CIWEM’s Annual Conference will be held on 28th – 29th April in London. To find out more, including who is speaking and exhibiting, go to http://www.ciwem.org/events/annual_conference.